Mayor Ray Plummer was all smiles as bulldozers, front-loaders and massive trucks dug into the mountain of coal waste that towers over his home and this tiny Cambria County town of 200 along the stone-cold-dead Little Conemaugh River. And if this project is successful, those environmental, economic development and employment benefits could eventually extend throughout the state and nation. That’s because the Ehrenfeld project is the first of 14 in the state funded by a $90 million federal pilot program that aims to fix dangerous mining legacy problems in Pennsylvania, West Virginia, and Kentucky, while also providing work for unemployed miners. If the pilot project’s formula proves successful, it could persuade Congress to support the RECLAIM Act, a proposal introduced by Rep. Hal Rogers, R- Kentucky, that would make an additional $1 billion available from the Abandoned Mine Lands Fund over the next five years to accelerate mine land reclamation and employ out-of-work miners. U.S. Interior Secretary Sally Jewell said the Obama administration fully supports and recognizes a moral obligation to clean up scarred mine lands and assist unemployed miners. 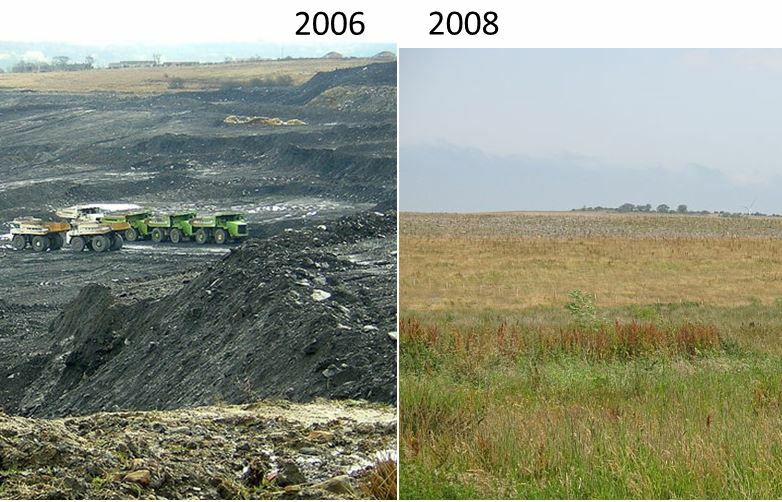 “The Ehrenfeld project is an example of how we can work together to make strong and smart investments in coal communities that not only put people back to work but restore our lands and waters to benefit the health and well-being of these communities,” Ms. Jewell said at the groundbreaking on August 11, 2016.